Ok, so you’ve done it. The dates of your trip are picked out, you’ve told your boss to take this job and shove it, you’ve searched Google Maps and PetsWelcome to find the best places to vacation with your dog, and you’ve told your mom to stop leaving comments on your Facebook wall about all this. Now what? Well, now you take the trip with your best friend, your dog. But first, you have to find hotels, motels, bed and breakfast places that accept pets and see if their policies will allow your Great Dane to stay or your pack of ten daschunds. Hey, I don’t know how you ended up with ten little daschunds but they are awfully cute. That’s not the point. The point is to find a place to stay that seems responsible, clean, and does care about you and your pet. Do they require health certificates or copies of vaccines? As much as that can sound like a pain to get before a trip. It’s a safety measure that has all the guests in mind. What if you are nipped by a stranger’s dog who is staying there? Don’t you want to know that the dog is healthy, had a rabies shot recently, and is ok? I do. What are the rules for leaving a pet alone in the room? Some hotels will say you can’t leave the dog alone and others will require that you bring your own crate. Some hotels may even have a boarding and daycare facility associated with them so you can bring your pup there while you check out the sights. On the hotel grounds, where are you allowed to walk your pet? Late night potty breaks mean that it would be good to know where on the hotel property your pet can go and if there are bags to clean up afterwards available. No one, trust me, no one likes stepping in that mess. Are there pet supplies available such as dog bowls? Some hotels have little pet packages of treats, a bed, and bowls. Others are more barebones and only offer a few treats. If you forget or lose a dog bowl, it’s good to know if they can provide one or if you need to find a pet store. Do they have a list or resource guide to the nearest dog parks, vets, pet-friendly restaurants in the area? Although this isn’t a requirement and many of us can find these with a few google searches, it’s so nice when hotels have the “hook up” and can hand you a print out or pamphlet of things to do, how to get there, and numbers to call. Are there off-leash and on-leash areas in the hotel? Some dogs are not as happy to meet other dogs as yours might be and may show aggression when being approached. Ask the hotel what their rule is about entrances, exits, and public areas like the lobby. At least you’ll know that if there is a fearful or slightly unfriendly pup, your furry buddy will be safe. Are there any restrictions based on size and breed? While your dog might be ok and allowed, your best friend’s dalmation pit-bull mix might not be and that could toss a monkey wrench into your BFF vacation. What’s the maximum number of pets per room (or guests allowed) and what are the fees? The last thing you want to experience is being unable to check-in to the hotel that you booked becuase you have two dogs or get hit with an extra fee that was not made clear on the website. Ask before you go. Do they offer any extra services? 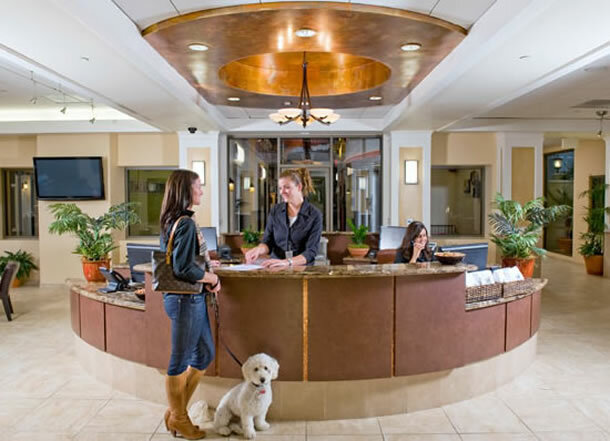 Some hotels offer dog-walking, dog-sitting, and other amenities for pets who are guests. Others do not but as stated earlier, may have a list of daycares nearby. It’s always good to check and gives you some flexibility in planning what you can do and how long you can go out without worrying that your buddy will get bored or lonely. It’s always better to go as prepared as possible. Your pet and your peace of mind will thank you. When you travel with your buddy, what other questions and things do you look for in a pet-friendly hotel?